My review copy: I received a copy in exchange for an honest review. In this compulsively readable historical novel, from the author of the critically-acclaimed Two Sisters, comes the story of two young women—one in America’s Gilded Age, one in scrappy modern-day California—whose lives are linked by a single tragic afternoon in history. 1888: Elizabeth Haberlin, of the Pittsburgh Haberlins, spends every summer with her family on a beautiful lake in an exclusive club. Nestled in the Allegheny Mountains above the working class community of Johnstown, Pennsylvania, the private retreat is patronized by society’s elite. Elizabeth summers with Carnegies, Mellons, and Fricks, following the rigid etiquette of her class. But Elizabeth is blessed (cursed) with a mind of her own. Case in point: her friendship with Eugene Eggar, a Johnstown steel mill worker. And when Elizabeth discovers that the club’s poorly maintained dam is about to burst and send 20 million tons of water careening down the mountain, she risks all to warn Eugene and the townspeople in the lake’s deadly shadow. Present day: On her 18th birthday, genetic information from Lee Parker’s closed adoption is unlocked. She also sees an old photograph of a genetic relative—a 19th century woman with hair and eyes likes hers—standing in a pile of rubble from an ecological disaster next to none other than Clara Barton, the founder of the American Red Cross. Determined to identify the woman in the photo and unearth the mystery of that captured moment, Lee digs into history. Her journey takes her from California to Johnstown, Pennsylvania, from her present financial woes to her past of privilege, from the daily grind to an epic disaster. Once Lee’s heroic DNA is revealed, will she decide to forge a new fate? Time is a series of minutes, gathered into hours, twisted into days, braided into months, and coiled into years. "It’s been my experience that presence and silence are most helpful," she says. "Be there without judgment or advice to listen when he is ready to talk." Mary Hogan's writing has captivated me ever since I read "Two Sisters" in 2014. I was beyond excited when I was approached to read and review her latest book "The Woman in the Photo". The story starts off in 1888 with Elizabeth Haberlin, her little brother and her mom on a train going away for their summer retreat to Johnstown, Pennsylvania. Elizabeth and her family are part of the elite class and they summer in an exclusive summer club that is set above the town of Johnstown. Elizabeth has always looked forward to these summers until an event opens her eyes to who her family really is and what is important in life. The story quickly changes gears to present day with Lee Parker approaching her 18th birthday. She is far from privileged and she can't wait for her birthday to find out about who she is. She received a letter stating that on her 18th birthday she could know some information on her adoption. It is just Lee and her mom Valerie now and they live in a pool house where Lee's mom is the maid for the family that live in the main house. They have to park several miles away so no one knows about them. Her father skipped out and so did her brother. Lee is lost and although she adores Valerie, she wants more. Weaving together two totally different story lines is difficult, but Mary Hogan makes the transitions seamlessly. I was impressed by her research of the historical data of the Johnstown flood, the historical pictures included in each chapter and the way the story gets more detailed and suspenseful as you read. The only change I'd make if I could would be telling more background on the town of Johnstown, the people, their day to day lives and how the flood affected them all. I feel like this part of the story was a bit rushed where more detail could have made the story absolute perfection. 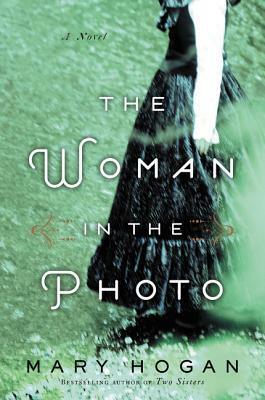 The Woman in the Photo was a solid read that I'd definitely recommend to any avid reader. The Johnstown, Pennsylvania flood was an eye opener to me and something I never knew about. As a history buff, I will without a doubt be picking up more reads with this theme in them. That being said, Mary Hogan is quickly becoming a favorite author of mine in historical fiction reads.